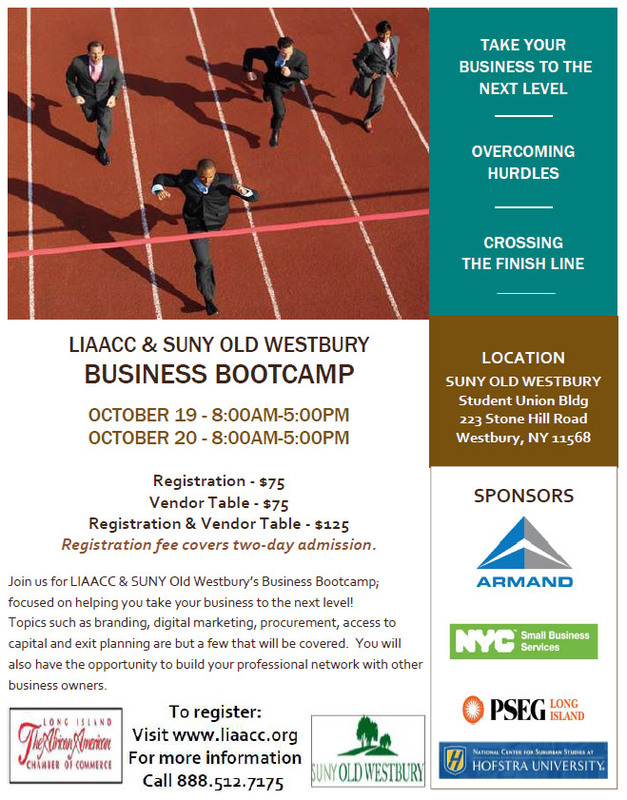 The Long Island African American Chamber of Commerce, Inc, (LIAACC) and SUNY Old Westbury are offering a Business Bootcamp on Friday, October 19, 2018 from 8am-5pm and Saturday, October 20thfrom 8am-5pm at SUNY Old Westbury. Corporations, Small Business Owners, Professionals, Service Providers, Chamber Leaders and Chamber Members and Local Leaders of a wide cross section of industries in the New York Metropolitan region will be participating in the upcoming boot camp. The purpose of the Bootcamp is to empower and motivate business owners, so that they take their business to the next level. No matter what stage a business is in (start up, growth stage or established stage), it is important to set goals and move to the next level. It is like having a business “GPS” that recalculates your route when you make a wrong turn. The Theme is “Stay on Track and Take Your Business To The Next Level”. We will cover several topics that will help entrepreneurs stay focused on ideas and strategies that will make an impact on the future of their business. Selecting the Business structure that best supports your business model and protects your interest. Frantz Pierre-Louis, CPA, President of Pierre-Louis and Associates. How to Brand your Business Effectively will be presented by Winnie Benjamin, a Business Performance Advisor, and graduate of the John Maxwell Leadership certification program. Sue Glenn, a social media trainer will teach how to effectively use Digital Marketing to promote business and attract customers. Barbara Brudie, Supplier Diversity Manager from PSEG LI will talk about how to build relationships with procurement officers and get contracts. Kyle Griffith and Anthony Citrolo of New York Business Brokerage will discuss How To Prepare And Stay On Track For A Profitable Exit. Shalei Simms, Associate Professor and Assistant Vice President for Academic Affairs from SUNY Old Westbury School of Business, will present on the importance of having a Business Plan. Our panel discussion “How I Stayed on Track” will be moderated by Terri-Arnold Mckenzie of TAM Consulting, Inc. The panel will include Barbara Armand, CEO of Armand Corporation; Deidre Helberg, CEO of Helberg Electrical Supplies; Lloyd Clarke, President of Money Can Hear; Frantz Pierre-Louis, President of Pierre-Louis and Associates, and Dr. Linval Frazer of SUNY Old Westbury School of Business. They will empower their peers by sharing stories about their journey and strategies that worked for them. The keynote speaker is Deb Ingino, Executive Director of the John Maxwell Leadership team, and a sought after worldwide motivational speaker. She is a mentor and consultant to business leaders who want to move into a higher level of performance. All speakers and vendors have been asked to share how their product and services will help businesses “Stay on Track and Take Their Business To The Next Level.” That is one of the unique aspects of the Bootcamp. Our sponsors include, SUNY Old Westbury; Armand Corporation; PSEG Long Island; SJ Edwards, Inc., Hofstra National Center for Suburban Studies; NYC Small Business Services; and Long Island Development Corporation. The registration fee is $75.00, which includes 2 days of workshops, meals and a participant workbook.